The Integrity Monitoring protection module detects changes to files and critical system areas like the Windows registry that could indicate suspicious activity. It does this by comparing current conditions to a baseline reading it has previously recorded. Deep Security ships with predefined Integrity Monitoring rules and new Integrity Monitoring rules are provided in security updates. Note: Integrity Monitoring detects changes made to the system, but will not prevent or undo the change. You can enable Integrity Monitoring in policies or at the computer level. 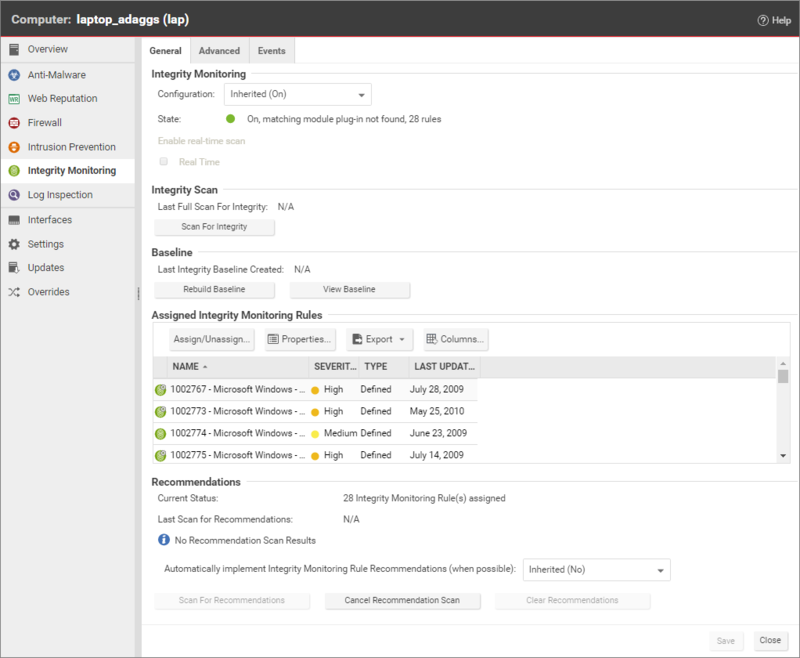 You can enable Integrity Monitoring in the settings for a computer or in policies. To do this, open the Policy or Computer editor and go to Integrity Monitoring > General. Set the Configuration to "On" or "Inherited (On)" and then click Save. Run a Recommendation scan on the computer to get recommendations about which rules would be appropriate. To do this, open the Computer editor and go to Integrity Monitoring > General. In the Recommendations section, click Scan for Recommendations. You can optionally specify that Deep Security should implement the rule recommendations that it finds. Recommended Integrity Monitoring rules may result in too many monitored entities and attributes. The best practice is to decide what is critical and should be monitored, then create custom rules or tune the predefined rules. Pay extra attention to rules that monitor frequently-changed properties such as process IDs and source port numbers because they can be noisy and may need some tuning. As described above, when you run a Recommendation scan, you can have Deep Security implement the recommended rules automatically. You can also manually assign rules. In the Computer or Policy editor, go to Integrity Monitoring > General. The "Assigned Integrity Monitoring Rules" section displays the rules that are in effect for this policy or computer. To add or remove Integrity Monitoring Rules, click Assign/Unassign. 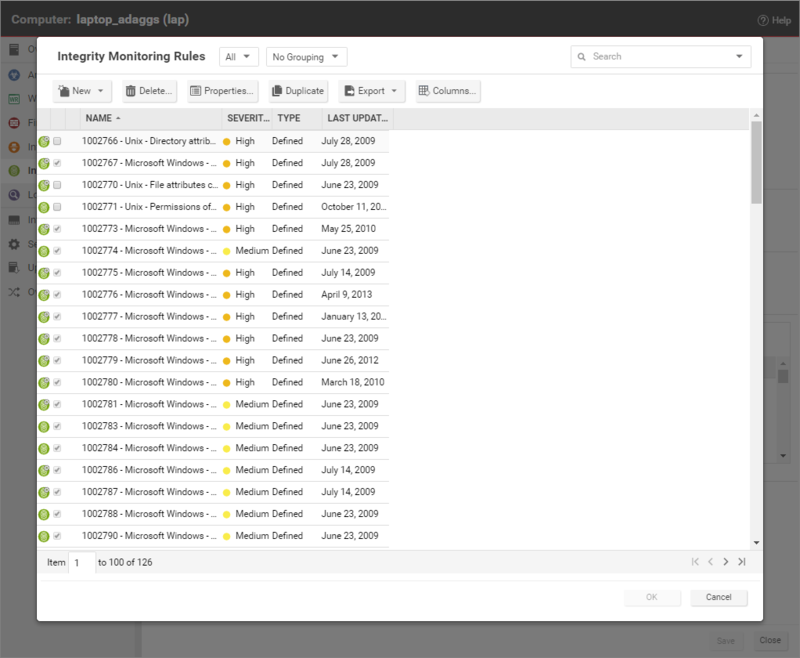 This will display a window showing all available Integrity Monitoring Rules, from which you can select or deselect rules. Some Integrity Monitoring rules written by Trend Micro require local configuration to function properly. If you assign one of these rules to your computers or one of these rules gets assigned automatically, an alert will be raised to notify you that configuration is required. You can edit an Integrity Monitoring rule locally so that the changes apply only to the computer or policy being edited, or globally so that the changes apply to all other policies or computers that are using the rule. To edit a rule locally, right-click it and click Properties. To edit a rule globally, right-click it and click Properties (Global). You can also create custom rules to monitor for specific changes that concern your organization, such as a new user being added or new software being installed. For information on how to create a custom rule, see Integrity monitoring rules language. Tip: Integrity Monitoring rules should be as specific as possible to improve performance and to avoid conflicts and false positives. For example, do not create a rule that monitors the entire hard drive. The baseline is the original secure state that an Integrity Scan's results will be compared against. To create a new baseline for Integrity Scans on a computer, open the Computer editor, go to Integrity Monitoring > General and click Rebuild Baseline. To view the current baseline data, click View Baseline. Tip: It’s a best practice to run a new baseline scan after applying patches. Periodically scan for changes. To perform an on-demand scan, open the Computer editor, go to Integrity Monitoring > General and click Scan for Integrity. You can also create a scheduled task that performs scans on a regular basis. Ensure Integrity Monitoring is enabled. Go to the Computer or Policies editorYou can change these settings for a policy or for a specific computer. To change the settings for a policy, go to the Polices page and double-click the policy that you want to edit (or select the policy and click Details). To change the settings for a computer, go to the Computers page and double-click the computer that you want to edit (or select the computer and click Details). > Integrity Monitoring > Assigned Integrity Monitoring Rules. Click Assign/Unassign. Search for 1002773 - Microsoft Windows - 'Hosts' file modified and enable the rule. This rule raises an alert when changes are made to C:\windows\system32\drivers\etc\hosts. Search for 1003513 - Unix - File attributes changes in /etc location and enable the rule. This rule raises an alert when changes are made to the /etc/hosts file. Modify the above file and save the changes. Go to the Computer editorTo open the Computer editor, go to the Computers page and double-click the computer that you want to edit (or select the computer and click Details). > Integrity Monitoring > General and click Scan for Integrity. Go to Events & Reports > Integrity Monitoring Events to verify the record of the modified host file. If the detection is recorded, the Integrity Monitoring module is working correctly. On-demand scans: Even when Integrity Monitoring is off, you can run an On-demand Integrity Monitoring scan. To do this, open the Computer editor and go to Integrity Monitoring > General. In the Integrity Scan section, click Scan for Integrity. Scheduled scans: When Integrity Monitoring is on, you can schedule Integrity Monitoring scans just like other Deep Security operations. Deep Security checks the entities that are being monitored and identifies and records an event for any changes since the last time it performed a scan. Multiple changes to monitored entities between scans will not be tracked; only the last change will be detected. To detect and report multiple changes to an entity's state, consider increasing the frequency of scheduled scans (for example, daily instead of weekly) or enable real-time scanning for entities that change frequently. Real-time scans: When Integrity Monitoring is on, you can select the Real Time checkbox to enable real-time scanning. When this option is selected, Deep Security monitors entities for changes in real time and raises Integrity Monitoring events when it detects changes. Events are forwarded in real time via syslog to the SIEM or when the next heartbeat communication to the Deep Security Manager occurs. To change the Integrity Monitoring CPU Usage Level setting, open the Policy or Computer editor and go to Integrity Monitoring > Advanced. The events generated by the Integrity Monitoring module are displayed in Deep Security Manager, under Events & Reports > Integrity Monitoring Events. Event tagging can help you to sort events and determine which ones are legitimate and which ones need to be investigated further. You can manually apply tags to events by right-clicking the event and then clicking Add Tag(s). You can choose to apply the tag to only the selected event or to any similar Integrity Monitoring events. The Trend Micro Certified Safe Software Service. A Trusted Common Baseline, which is a set of file states collected from a group of computers. For more information on event tagging, see Apply tags to identify and group events.